Are you on the edge of your seat yet? Has the wait to learn the prize for Eating Your Words 2010 been a persistent flame, raising the anticipation to a boiling point, until you're just about ready to explode with excitement? Well, simmer down because the time has come for me and Jennifer of Savor the Thyme to make the announcement . . . But first, I must say that the encouraging comments we've received so far have been wonderful, and proving that the language of food is global, many responses have come from Europe, Australia, Asia and South America. Too often, Jennifer and I have read of the disappointment expressed by non-US bloggers that they are not eligible for contest prizes, although, to their amazing credit, they still participate with as much enthusiasm as if they were. This time, we want to put the prize within reach of everyone, so we are thrilled to announce that Eating Your Words 2010 is open to ALL participants! We'll ship the prize to the winner, whether he or she is in Manila, Philippines or Manila, Arkansas (yes, there is such a place). Oh, yes - the prize . . . While you might have been perfectly satisfied with the admiration of your fellow bloggers and accolades from the general public, it's always nice to get something a little more tangible. So, how about a very tangible, six-and-a-half pounds of solid, Minnesota-forged cast iron? With great pleasure, Jennifer and I announce that the prize for Eating Your Words 2010 is a gorgeous aebleskiver pan, courtesy of Aunt Else's Aebleskiver! This heirloom quality piece of cookware is made right here in Minneapolis and was specially designed for the company, based on an original pan owned by its namesake and passed down through generations of her family. It is no secret that I am a devoted fan of Aunt Else's Aebleskiver; last summer, I was thrilled to receive my very own pande from Chad Gillard, president of the company. I also had an opportunity to watch him and two of his co-founders, Sarah Engwall and Lisa Timek, demonstrate its use and was enthralled by how deftly they turned simple batter into fluffy, perfect little spheres of edible delight. The story behind Aunt Else's Aebleskiver is also a tale of how the closeness of family and the deep ties of friendship compose a solid foundation for a successful business. If you'd like to learn more about Chad, Sarah, Lisa and the company they are working hard to build, read their story at Full Circles: Aunt Else's Aebleskiver. You could fill them with jams, jellies and sauces, or else cook them up plain and then top with your favorites . . .
. . . . or roll them in cinnamon sugar and serve with a demitasse of rich cocoa. Many aebleskiver batter recipes are very similar to standard pancake batters - that is, depending on what you're idea of a 'standard pancake' is! In other countries with similar pans, such as Thailand's kanom krok, or Indian paniyaram, the mixture is often made with rice flour, giving the end result a soft yet slightly chewier texture. Here's my take on a Danish-Asian fusion pancake ball, embraced by sweet cocojam [click on photo for recipes]. There's not much to it: prepare your favorite omelette recipe, decreasing the amount of milk by about half (if you use it, like I do) to allow the eggleskivers to hold their shape. Instead of oil, I put a small bit of butter in each well and then pour the omelette mixture immediately, before the butter starts to brown too much. Add fillings such as cheese, ham or sausages (these will also help the 'skivers hold their round form), and continue to cook as you would regular aebleskiver. If you had this pan, what sorts of 'skivers would you make? During the Eating Your Words 2010 challenge, Aunt Else's Aebleskiver is offering a 10% discount for any purchases made at their store. So if you can't wait to get a pan of your own, please head over to www.AuntElse.com, check out their wonderful products and enter the code "EYW" during checkout to receive your discount! We all know that food engages the five physical senses of sight, sound, smell, touch and taste; now, we can add a sixth sense - fun! Jennifer and I hope that you will join us for Eating Your Words 2010 - just let your food do the talking . . .
1. 'Write, spell or draw' using food or drink, and create a blog post about it by midnight on Wednesday, March 31st. We will accept any previous blog posts. 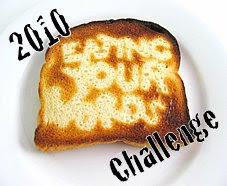 Please stay tuned for more exciting announcements about Eating Your Words 2010! I am working on my idea as I speak...hmmm, was that a play on words? Fun fun fun it is, fun! Speaking of being on the edge of your seat: I am giggling with excitement over what people will create! Awesome prize! I'll be working on mine this weekend. Although it may require a few tries to get it just right, wish me luck! I've been chasing inspirations for this challenge... hmmm i gotta have one soon! This is an awesome contest and prize. I can't wait to see what everyone comes up with! I loved the eggskivers. That was an inspired idea. This was my first visit here and I loved what I found. I'll be back often. My mother in law just bought an ebelskeiver cookbook. They all looked so good that I had to stop reading the cookbook because it was making me too hungry! Your post is the same! I will have to start thinking of how to write with my food now. I gotta get crackin' on my mine!!! i'm so lagging. This is awesome! Hmmm thinking if I will get enough time to put up something by 31 March.... will see will see! Your piped word cookies look amazing - and seem like the perfect project to complete with a small child in tow! Ah, the future possibilities with Roman have just been kicked up a notch. Thank you! But then again, this pan and its contents look awesome. I love food in the shape of spheres - like a little gift to break open. If I can think of something, and have the time, I will definitely try to enter! If I had one of these I'd make classic aebselkivers and fill them with all sorts of jams from here. Yum. Hello everyone! Jennifer and I are so excited to offer this prize, especially since international entries are also eligible. So we hope you'll join us! Chef E - It is absolute F-U-N! Can't wait to see what you'll have for us! Jennifer - I know, I know! It's great that there's 2 more weeks for people to come up with stuff, but it's also 14 days before we get to post all of them. Hang in there! Malou - There's still 2 weeks left, plenty of time to become inspired. We know you can do it! Fresh Local and Best - Have you seen last year's entries? Everyone was wonderfully creative and I know it will be the same this year. Please do come back in to check out the round-up! Mary - Thank you and welcome! So happy that your first visit was during such a fun event. Hope you'll consider joining in! Joie - Absolutely! I would love to see that cookbook. This is a great pan, so I hope you'll take a shot at winning it! Kitchen Butterfly - Yay!! I hope you had a wonderful holiday - perhaps there's some inspiration from it for this event . . .
Bob - Knowing what I know now, I can tell you that this pan is worth it. We'd be thrilled to have your entry! Trisha - Oh, I hope so! We would love to see our international friends join in, so everyone is eligible for the prize! Spud - I'm always waiting 'til the last moment to find my inspiration. But you know we'd love to see an entry from you again this year! Brenda - He would love these cookies and you'd have a grand time making them together. And I do hope you will be able to enter (no pressure) - Jenn and I are so excited that international participants are eligible for the prize. 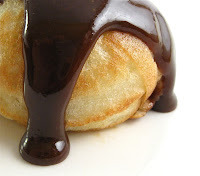 Think of the aebleskiver possibilities . . . ! Manggy - Yes, please do enter! I wish I had all the jams I saw during the Christmas food fair in Power Plant Mall, at Salcedo and various other markets during our visit. I'd be making filled aebleskivers every weekend . . .
Wow, its been a year? I remember the last time you hosted the Eat Your Words competition. that looks so delicious. svory little bites for breakfast. it'd be like having boiled egg for breakfast, but more savory, more is the word umame? more better how bout .. boiled egg with options.